It's another great day in Lee County. I'm having a great time with my new job, snapping colorful photos, writing fun stories/notebooks and doing play-by-play analyses of the SEC team I cover. You may know them by the "AU" on their helmets. So what's the latest with me? I love my new camera lenses. I snapped the photo above at dusk one day in July. How did I do that? Well, I used the camera as I navigated down a paved asphalt surface. It's called multi-tasking and I'm pretty new to the whole thing. I thought the song was appropriately inappropriate. Don't we all have friends whom we wish would follow "ancient history" and strip? Adam Ant sure does. Or at least did in 1983 when he recorded this minor hit. I'd never name names, of course, and it's important to note that Adam Ant didn't. Seems like old times, and that makes me kind of sad. Makes me sad we aren't together as a family. I am reading AuburnSports, but don't comment often. Just wanted you to know I was still around! Y'all are together as a family! I'm just out of the conversation. J, props on the new gig. I still wanna check this site every morning....like the good ole days. If I can give up some $ on another one of my many habits sometime...maybe I'll try your new site out. I always enjoyed your fine work. Man, I really dig what you're saying, Jay G. I like how the camera lens represents Rasputin in your metaphor. I think the way you present the czars is a bit of a stretch, though. 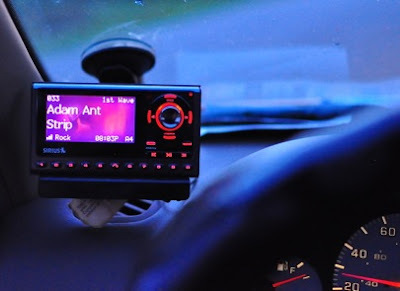 Which SiriusXM radio is that? Is it a Sportster? I miss my Sportster. P.S. Have you checked out SiriusXM Soccer? It's 92 on Sirius and 207 on XM, I think. Good stuff. Ray Hudson and Neil Barnett were the hosts this morning. Those guys are fun together. I think its the blue footed booby radio. It's very considerate that you're only driving 27 mph as you snap the pic. Fast driving and photo taking do not play well together. Don't know if you noticed, but I had to use an old parking receipt to keep my Sirius receiver tiled upright. Only the best! If I started talking about _U_U_N football here, I wonder if "anyone" in suburban Washington, D.C., would notice. It may be time to start pushing boundaries again. How is Burn Authority going? Burn Thority...the faithful are trying to hang on, bringing substance from outside sources. Burn Thority is the best! Liked your pics/breakdown of the Burn defensive plays, JayG. I'm hoping that a more conventional (normal paced) offense will make Burn's defense look better. If they have time to get lined up properly the angles will be better = better tackling. That's my hope. Done with the loss; looking for positives now. The Authority has not brought any new substance. Some of the peeps have no regards to the rules you set. Most is still civilized but the same political and religion talks get old when your looking for Auburn stuff or fun stuff to talk about. Norm is still a pain, Eddie is still crazy, THT is gone, and bubbs is well.... Bubbs. That's about it. Guess what, JayG. Madmin is making people mad again. I have to give it to them. Those guys are gifted. What's Terry mad about now? No likey linkies of any kind. And boy how. The hotties got hot about it. Madmin should have just left it alone and let the new guy take over as soon as he could. I can't believe Jay had to work for these people. They don't quite seem "with it." Guess they don't teach "Maintaining Online Communities 101" at journalism school yet. They aspire to o e day attain Bush League status. You all are a great group of people. They should be glad to have you all around. We are and they should. But...they're going to screw it up, I know it. I think the new guy started yesterday. So maybe that will help? He may or may not attuned to "Online Communities 101" as Michaela described yesterday. Either way is fine. We have a great attuning committee. Norms not on it. That's what this world has been missing, Adam Ant love. There just isn't enough Adam Ant love in this world. As for Burn Thority, I feel sorry for MAdmin. He is in a very poor situation. He is correct that I have seen stuff posted that really should not have been posted. You would have steered it in the right direction. Now, the no links think went over with a roaring thud. MAdmin worded the request poorly and really should just address specific issues where posting of inappropriate content has happened. Largely, Burn Thority hasn't changed, but there have been a few incidents. Deleting inappropriate stuff and sending a private message to the violators would have been appropriate. Each post takes up a lot of room. HABOTN 1.0 was pretty condensed. HABOTN 2.0 was still pretty good. With GTR, you can't see a lot of the thread on one screen, and they don't display avatars, which is kind of anoying. They have that weird shield stuff. HABOTN 2.0. I said my goodbyes. No more clicks for me. Ya'll see how Gannett way overpaid for an App called Keyring? What business do they have buying apps when they cannot afford to pay the writers? I liked Keyring a lot when I used to carry a cellular phone. It was a good app. I'm sure they'll destroy it. Do you drink Dos Equis, PF? Only when I drink beer. Just watched a strange indy comedy in Dutch with English Subtitles at the local indy theatre. Lots of nakedness. I had a couple of PBRs and a pizza during it. Good times. I played tennis last night and drank water during it. Good times. I watched F4* and the dog chase each other around the yard last night, then he (The Boy, not the dog) and I played Wii. I had some beer during those activities but it wasn't Dos Equis or PBR. Has football season started yet? I had Sweet T at a Way 2 Serve Banquet last night. Frankenbummer, don't quit on 2.0. I forbid it! Is anyone the boss of PF? Where PF is concerned, not only can you not stop him, you can't even hope to contain him. MJT, if you start telling me what to do, I'll make a cat killing machine killer that will kill all of your cat killing machines. Not only is nobody the boss of PF, PF is has an entitled view towards his freedom. yeah, I'm done with 2.0. I'd love to hang out there, but refuse to contribute to page views/advertising $$ for that organization. Harrison already pretty much quit 2.0, so I don't even need those machines now anyway. So rejoin 2.0, and also, CLEAN UP YOUR ROOM! JGT, you still shooting the Nikon 5000? you mention new lens or lenses. What'dgya get? I wish I had a D7000! I still use a D5000. The new site bought me a 70-200 f2.8, which runs $1,600 to $2,000. It's perfect for most anything. If you're shooting outside, you can make great pictures with the "standard" 55-200 lens that Nikon sells for $200 or so. I have this lens to shoot night games and inside the dome. For usual stuff, I carry a 35mm f/1.8. It's awesome. I don't miss the zoom. ...and I want the D800, or the D4. But D7000 is a nice camera and good for what I do. Covet your 70-200 2.8. My lens that stays on the camera 90% of the time is 18-200 f3.5 VRII ~$850'ish. Miss that lower 2.8 for dusk, under the lights. Also looking around a little at something up to the 300+ for my kid's sports, likely it won't be 2.8,....that's a lotta $$$. I use an iPhone camera. It works pretty well. I'm a bit further behind on the technology for somebody from my generation. I still think my Droid Incredible from two years ago is awesome even though I'm eligible for a new upgrade. Burn Thority appears to have crashed and died. Long live Burn Thority. I gonna go whittle some sticks on the porch. Burn Thority ... Rest In Peace. Becky. Haven't seen you in hours. So. If things continue as they are. 2014 should be another big year for the hacks. As far as drama is concerned. 08, 10, 12, 14. Anyone care to speculate what will be going on in 2014 that will have the faces of Auburn fans melting off? Auburn Nazis looking for the Ark of the Covenant? 'cause their faces melted in that movie.